You will not find the secet history posted below (under the title Banca d’Amerigo) about the true origins of Bank of America on Wikipedia…or anywhere else on the Internet. If you google “Amadeo Giannini”, you will indeed find a sanitized history about the founder of Bank of America. His parents were originally from Genoa, one of the five Black Nobility strongholds in Northern Italy. Both Genoa and Venice served as the banking and corporate headquarters for the world’s first banking corporations. 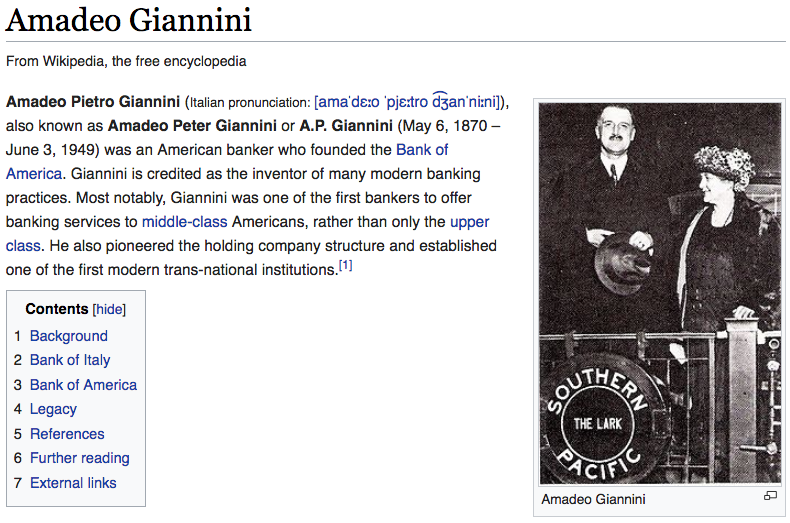 Not only did Giannini invent many of today’s risky banking practices, “he also pioneered the holding company structure and established one of the first modern trans-national institutions”. It’s quite unlikely that a produce man was capable of such feats, unless his Black Nobility sponsors funded him and mentored him every step of the way, which they likely did. The true back story of how the Black Nobility took over the American banking system is still one of the most hidden today. There’s virtually nothing in the public domain about this very deep and broad conspiracy except a couple of exposés that only touch on the subject superficially. This extraordinary secrecy has been maintained by purposeful design by the Black Nobility, as their roots go back millennia to the pre-biblical merchants and moneychangers sometimes known as the Babylonian Brotherhood. Amadeo Giannini founded the Bank of Italy in California which was later renamed the Bank of America. The Bank of America is still under the original charter of the Bank of Italy today. The BoA is the second largest bank in the United States with assets estimated around 2.2 trillion. The California founded Bank of Italy was later absorbed into Giannini’s holding company Transamerica Corporation before forming the Bank of America. Transamerica Corporation still exists and is involved in insurance and investments. Amadeo Giannini was the son of Italian-Genoese immigrants. Genoa was a powerful banking center in Europe for centuries. Wealthy banking families from Genoa include the Doria, Spinola, Grimaldi, Odescalchi, and Pallavicini families. Modern European banking originated in Italy and further developed during the Crusades through Templar bankers authorized by the Pope of Rome. The Bank of Italy now BoA made loans to the wine industry in California as well as loans to Walt Disney. Roy E Disney was a Vatican Knight of St Gregory. Amadeo Giannini made loans to FIAT in Italy after WWII. John Elkann is Chairman for FIAT and married to Donna Lavinia Borromeo. Pierre Casiraghi is married to Beatrice Borromeo and his mother is Princess Caroline of Hanover and she is the daughter of Prince Rainier III of Monaco from the Genoese House of Grimaldi. The Genoese House of Grimaldi were co-founders of the Bank of Saint George which was internationally in operation for nearly 400 years. The central bank of Italy is also called the Bank of Italy and founded out of the corruption scandal involving Banca Romano. The Borromeo family were noble landowners, merchants, and bankers that did business in Florence, Milan, and Venice. The first Director of the Italian Bank of Italy was Bonaldo Stringher and he was from Venice. Luigi Einaudi was the third Director of the Bank of Italy and from Piedmont. The Borromeo family ruled right near Piedmont and still own islands there in Lake Maggiore. The Sella family are bankers and merchants from Piedmont which currently own Banca Sella Group which operates in Switzerland where banking is private. The Sella family are Court Factors for the House of Borromeo. Amadeo Giannini was really working for the old Florentine-Genoese-Venetian bankers as a proxy to establish one of the largest banking institutions in the United States. Still existing banking families of Venice, Genoa, and Florence include the Giustiniani, Odescalchi, Doria, Borromeo, Medici, and Pallavicini families. The Warburg family were originally Venetian bankers known as the Del Banco family. Warburg Pincus was in contract with UniCredit that earlier merged with the Capitalia which previously merged with the Bank of the Holy Spirit that was created by the Borghese banking family of Rome in 1605. The Banchieri family are an aristocratic banking family of Luca and Pistoia who established a branch in Feltre, Veneto near Venice and in Tortona, Piedmont. The Del Banco family was really a covert family branch of the Banchieri family. The Warburg (Del Banco) family helped to create UBS Bank. Bank of America went public on the market in 1978 and its likely these Italian banking families were Amadeo Giannini’s investors and financial backers that loaned him his first $150,000 to establish Bank of Italy. They all likely made large profits and continue to do so through the stock market. The current CEO and Chairman of Bank of American is Brian Moynihan and he’s Roman Catholic educated at Notre Dame Law School.